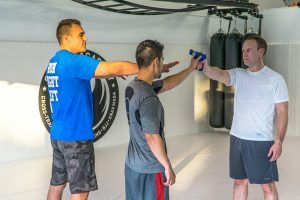 Self-defense training at Sparta Academy in West Los Angeles is an excellent way to get in shape and learn a valuable skill for everyday life. Everyone should know how to defend themselves when a threat becomes present. We take this very seriously and are prepared to teach you everything you will need in multiple different self-defense methods. Krav Maga is a system that was developed for the Isreal Defense Forces and has a background of several styles of fighting that have proven to be very effective for real-world situations and after many years was civilized to work for civilians and the local police forces. Muay Thai is a sport of combat and uses elbows, fists, knees, and shins as well as other aspects of stand up fighting. This is a sport for the physical and mentally disciplined students and makes for a very efficient fighter. Brazillian Jiu-Jitsu (BJJ) is a great combat sport for those who would like to focus on control and grappling. It takes critical thinking and a strong mentality while physically using leverage to control the opponent. This is martial arts style is very commonly used today in MMA events. Mixed Martial Arts is a sport that began in Greece in their Olympic games known back then as Pankration. There weren’t many rules to this sport and was called an empty-hand submission sport. The MMA we know today is a full contact combat sport in which the fighters are allowed to fight both on the ground and standing using techniques from several different combat sports. The first organized MMA fights started in Japan, before becoming popular worldwide. At Sparta Academy, we offer self-defense training in the West Los Angeles area. We offer personalized training and our instructors are knowledgeable in many different methods of self-defense. We offer group classes in MMA, Brazilian Jiu-Jitsu, and Krav Maga.